Anton grew up in an artistic household. His late father was the celebrated ceramist Esias Bosch. Anton spent his days playing and working with clay. After his studies in art he returned to ceramics and it was not long before he established himself as a renowned ceramic artist. “Everyone can find their own meaning in what I am trying to express”. 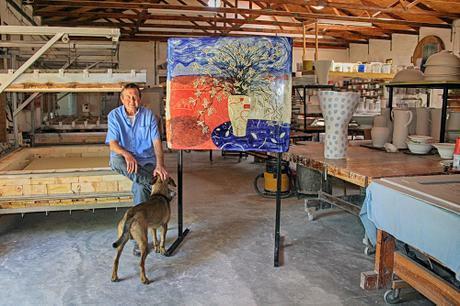 Anton’s work shows that he is a versatile ceramic artist. He has perfected complex techniques to produce a wide range of ceramics which are distinguished by one common feature: the artist’s honest expression of himself. Anton views his work as an experience which brings him into personal contact with the natural world and he endeavours to offer a real sense of this connection in his art. Thus the human figure, birds, trees, leaves, flowers, butterflies, fish, chameleons, shells, stars and moons are abundant in his decoration. Beneath each piece of work however lies a tale, metaphors of personal and universal stories. ‘I like to think my work is accessible simply because everyone can find their own meaning in what I am trying to express,’ he says.